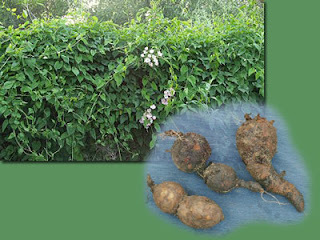 He-Shou-Wu or 'Polygonum multiflorum' is a tonic herb hosting numerous health benefits. It is known as a powerful kidney and liver tonic. Studies show that He-Shou-Wu extract improves the cardiovascular system, enhances immune functions, slows the degeneration of glands, increases antioxidant activity, and reduces the accumulation of lipid per-oxidation. He Shou Wu/ aka: ho-shou-wu, heshouwu, or shouwu; sometimes mistakenly called fo-ti, is obtained from the tuberous roots of Polygonum multiflorum. It is one of the more commonly used Chinese medicinal materials, and has a special reputation for preventing or delaying the graying of hair, even reverting gray hair to its original color, as well as having other benefits for the hair, such as treating alopecia. The herb is used for a variety of other therapeutic actions related to the traditional Chinese medicine (TCM) categories of nourishing blood and yin. Medicinal properties: Detoxicant, laxative, liver protectant, antioxidant, antibacterial. He-Shou-Wu is an effective anti aging herb. It also reduces the risk of fatal diseases like cancer and heat attack strokes. He Shou Wu was shown to have effects on the antioxidant system superoxide dismutase (SOD), accumulation of lipid peroxidase, and enhancement of cell-mediated immune responses. Major known ingredients: chrysophanic acid, emodin, rhein, chrysophanic acid anthrone, lecithin. Since the ancient china, he shou wu has been well known for its benefit to make hairs dark and people healthy. It helps with liver function and gets rid of fatigue, benefit the skin, strengthen the bone and muscles, and heart so that it also improves neurosis and sleep disorder. It helps anemia by generating blood, dysmenorrhea, uterus infection, chronic constipation and so on. And he shou wu is the very powerful in lifting the energy of the elderly. Its effect on the kidney function keeps people from having grey hairs and shedding and if taken for a long term, it also prevents the aging. Traditionally this herb is said to increase essence and blood. This combination of attributes indicates that it would increase fertility in a woman and sperm in a man since essence and blood are the two necessary qualities required to bare a child. He-Shou-Wu is good to strengthen the muscles and tendons. It is also very beneficial for the nerves. It is used for backaches, knee joint pain, traumatic bruises, and neurasthenia. It has been used to lower blood pressure. Many people say it helps them to fall asleep at night also. We found some incredible anti-aging capsules from Xocai, and they are designed to work on our inside, at the cellular level...for ENERGY AND IMMUNITY, HEART AND BRAIN...It is cocoa based and helps restore and replenish what we have lost..my husband and I are noticing more energy and just feeling great overall. Watch how it works..you won`t believe it! !